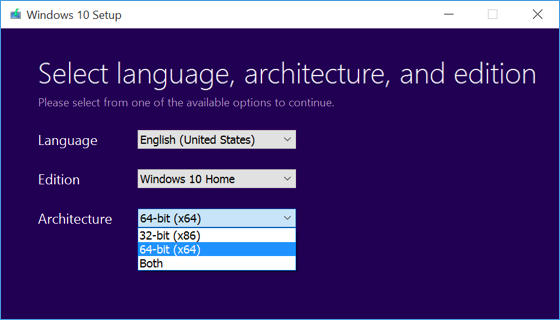 If you update the 32-bit version of Windows 7 or 8 (8.1) to Windows 10, you’ll get the 32-bit version of the new OS in the end. Some devices come with 32-bit operating system preinstalled, though their processors support Windows 10 64-bit as well. Therefore, you can change to this OS. It will be very well-timed, especially if you have already installed more system memory for your computer. 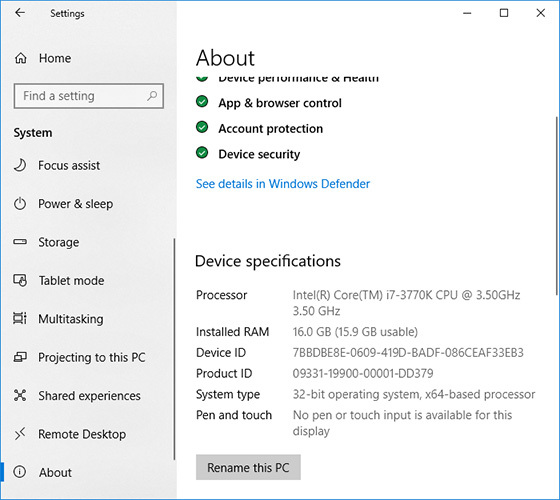 In this article we will tell you how to change Windows 10 32-bit into its 64-bit version. Let’s start with the advantages brought to you by a 64-bit Windows. Software optimized for 64-bit operating systems works faster than similar apps for processors that only deal with 32 bits (i.e. 4 bytes) per cycle. Moreover, 32-bit versions of Windows can use no more than 4 GB of system memory, and even so, not all that size is available for programs that you may want to run. Increased performance is another big bonus. A computer with 64-bit Windows will handle twice more data within the same time period than its counterpart with the humble 32-bit OS. If your computer has 32-bit versions of Windows 7 or 8.1, and you update the operating system to Windows 10, Microsoft will automatically provide you with a 32-bit version of the new OS. However, if your hardware supports 64-bit operating systems, you can move to a 64-bit Windows for free. The first step is to make sure that your processor supports 64-bit systems. To do it, open Settings > System > About. In the right pane, find System type. Your processor supports 64-bit versions, and you have a 64-bit version of Windows installed. Your processor doesn’t support 64-bit versions, and you have a 32-bit version of Windows installed. Your processor supports 64-bit systems. 1. If you see the line “32-bit operating system, x64-based processor” – you’re lucky. It means you are using Windows 10 32-bit, but your CPU can handle a 64-bit version as well. Attention: if you have a laptop or tablet PC, make sure there are drivers for 64-bit Windows in the manufacturer’s website (if driver bitness is not specified, it usually means both versions are supported). Download the drivers. 2. After that, download an original ISO image of Windows 10 x64 from the Microsoft website and create a bootable USB drive (disk). You can also create such Windows 10 x64 bootable drive following the official procedure, that is, using Media Creation Tool. 3. Start installation of the operating system from the USB drive. You don’t need to enter the product key during the installation. 4. If there is any important data in disk C, don’t format it to save the information. 5. Finish the installation process. The next step is installing original system drivers. This is the last thing you have to do when you change from Windows 10 32-bit to its 64-bit version. Even if you lost some important files in the course of moving to another operating system, you don’t need to worry. You can restore the deleted data easily with Magic Partition Recovery. It’s an all-purpose recovery tool, and it’s easy to use. The utility will recover any file of any type within minutes. The interface is user-friendly and looks similar to Windows-integrated Explorer. It has the built-in step-by-step wizard to make the recovery process as easy as possible. In the fast scan mode, the program finds deleted files in a few seconds, and offers you the wonderful opportunity to recover your lost data almost instantly.